A tooth that has been knocked out needs dental treatment immediately. First of all, try to locate the missing tooth and gently clean it with water. Hold the tooth only by its crown and avoid touching the roots of the tooth. Whilst holding the crown, place the tooth back into the socket in the correct position. If the tooth is unable to be placed back into the socket, place the tooth in the mouth between the gum and cheek or in a glass of cold milk. It is important to get to a dental office or emergency room straight away for the best chance at saving the tooth. Injuries to baby teeth are handled differently than injuries to permanent teeth. Baby teeth that are knocked out cannot be replaced and do not need to be placed back into the socket. If there is bleeding apply a cold pack and apply pressure. In small children the frenum (small fold of tissue inside the upper lip) tears easily and can bleed quite a bit. The area also heals very quickly on its own. Contact your dentist as soon as possible to discuss your child’s injury and the best plan of action. If a tooth becomes loosened or displaced (deeper into or out of its socket or pushed sideways), it is best to seek dental treatment as soon as possible. An examination by your dentist will determine what exactly is wrong with the tooth and the treatment required. Teeth that have been loosened or displaced may be splinted to another, healthy tooth to give them stability while they heal. In some situations, a root canal treatment may be necessary to save the damaged tooth. A tooth that has been broken or fractured (cracked) should receive treatment as soon as possible. If the injury extends to the tooth’s inner pulp tissue, root canal treatment will be needed. Depending in the extent of the injury, the tooth may need a crown (cap) to restore its function and appearance. 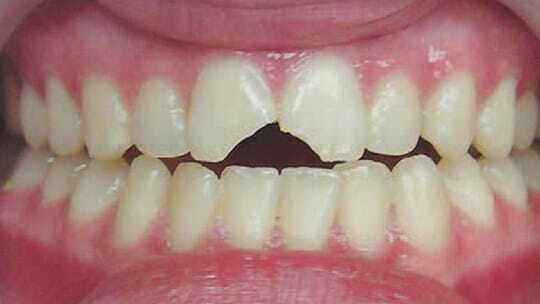 Chipped teeth are among the most common dental injuries and can generally be restored successfully. Minor chips or rough edges can be polished off easily with a dental instrument. Teeth with slightly larger chips can often be restored with composite resin filling material bonded to the tooth. When more of the tooth structure is missing, the best option may be porcelain veneers or crowns. These procedures can generally be done at your convenience. However, if the tooth is painful or sensitive to heat or cold, seek help straight away. In all cases the health of the injured patient is paramount. If you suspect a jaw or head injury from the accident, an emergency room visit is warranted before any dental treatment.